December 21st & 22nd 2017 "Holiday Classic 2017" at PGA National Resort & Spa – played on the "Fazio Course" in Palm Beach Gardens, FL. Jessy won 2nd place receiving a trophy shooting even after two days. On day 1 Jessy shot even (par being 36) for a score of 36. On day 2 Jessy shot even (par being 36) for a score of 36. 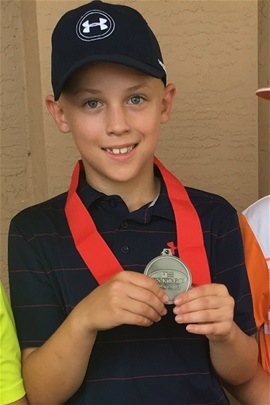 This was Jessy's second 18 hole tournament, distance was over 5,100 yards. 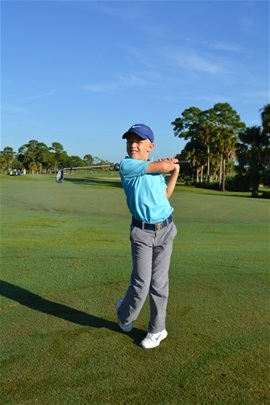 Jessy played in the boys age 10 and under division and finished in 10th place. This was a two day tournament with an overall score of 155 (par being 144) finishing at 11 over par. Daily scores of 77 & 78. 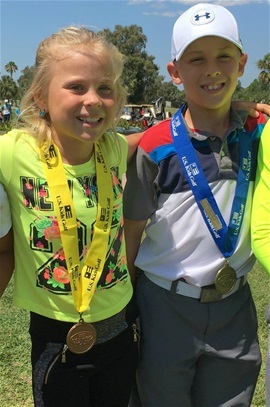 This was Jessy's first 18 hole tournament and with no caddie and distance of 5,100 yards. Jessy played in 9 & 10 year old division and finished in 4th place. This was a two day tournament with an overall score of 150 (par being 144) finishing at 6 over par. Daily scores of 76 & 74. Jessy shot an Eagle today. The course had very long yardages and it was raining, cold and very windy both days. Jessy did great. August 3rd, 4th and 5th, 2017 "U.S. 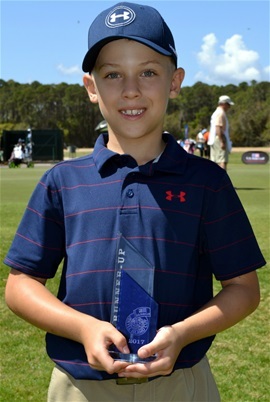 Kids World Championship - 2017" at Pinehurst, NC. Played on the Mid Pines Inn and Golf Club course back 9. 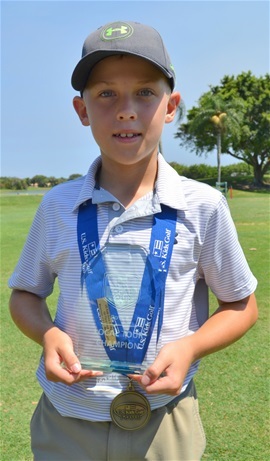 Jessy was runner up receiving a trophy with an overall score of 107 (par being 108) finishing at 1 under par for all three days. Daily scores of 35, 39 & 33 and on day three Jessy was bogey free. He shot 7 birdies over 27 holes. Jessy won 1st place receiving a trophy shooting 2 over par after three days for a final score of 110 (par being 108). This was Jessy's 1st International tournament win. 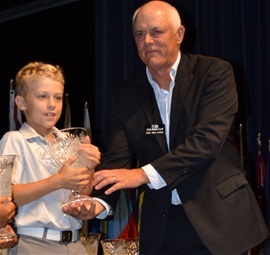 Jessy won 1st place receiving a trophy shooting 2 over par after two days for a final score of 74 (par being 72). This was Jessy's 2nd straight win in a row at Florida State. On day 1 Jessy shot 1 under par then that night heavy rains came in causing really tough course conditions on day 2. Jessy won 1st place receiving a gold medal. He shot two under par with par being 36. He made three birdies today. May 28th, 2017 "Boca Raton Local Tour Spring 2017" - Westchester Golf & Country Club in Boynton Beach, Florida. 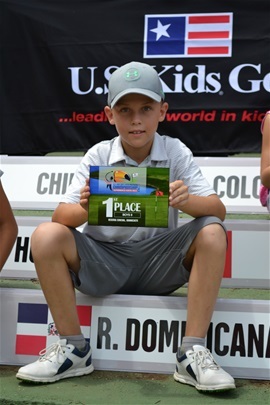 Jessy won 1st place receiving a gold medal and a Local Tour Championship trophy. 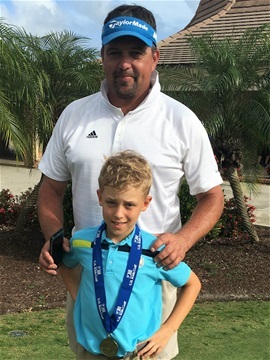 He shot one under par (par being 36) with a score of 35 and was bogey free. May 27th, 2017 "Stuart Local Tour Spring 2017 and Tour Championship" - Martin County Golf & Country Club in Stuart, Florida. 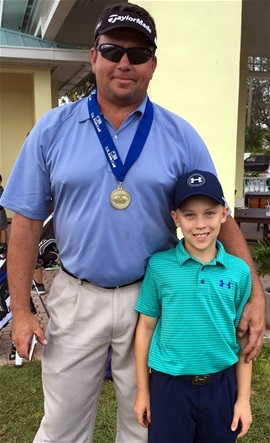 Jessy won 1st place receiving a gold medal and a Local Tour Championship trophy shooting par (par being 36). Jessy won 1st place receiving a gold medal. He shot two under par (par being 36) with a score of 34. Jessy shot an eagle today. Jessy won 1st place receiving a gold medal shooting 35 one under par with par being 36. 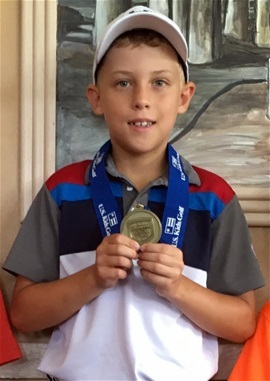 Jessy won 1st place receiving a gold medal shooting 32 (4 under par) with par being 36. Today he shot 4 birdies and was bogey free. Jessy won 1st place receiving a gold medal shooting par with par being 36. Jessy won 1st place receiving a gold medal. He shot par with par being 36. 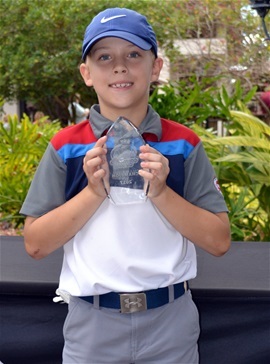 April 29th 2017 "The Honda Classic Junior Par 3 Challenge" - Palm Beach Gardens Par 3 Golf Course in Palm Beach, Florida. 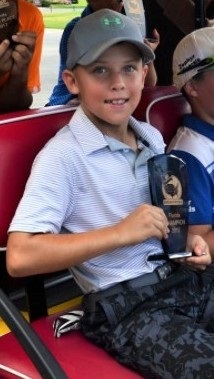 Jessy won 1st place receiving a trophy, he shot a 56 in the Boys Ages 8 to 11 Division. This was a national 18 hole tournament with par being 54. Jessy won this in a play off. April 22nd, 2017 "Boca Raton Local Tour Spring 2017" - Country Club of Coral Springs in Coral Springs, Florida. Jessy won 1st place receiving a gold medal. 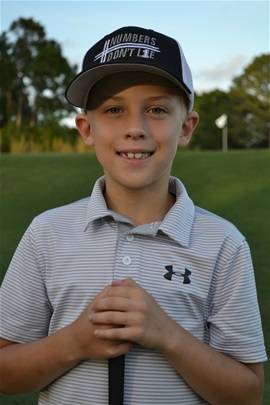 He shot an eagle today with a final score of par (par being 36). April 9th, 2017 "Stuart Local Tour Spring 2017" - Palm Cove Golf and Yacht Club in Palm City, Florida. April 8th, 2017 "Stuart Local Tour Spring 2017" - Martin County Golf & Country Club in Stuart, Florida. Jessy won 1st place receiving a gold medal shooting par (par being 36). Today he shot bogey free. 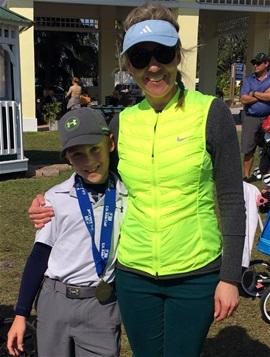 March 25th & 26th, 2017 "Jekyll Island Cup 2017" at Jekyll Island Golf Club on the Pine Lakes course in Jekyll Island, GA.
Jessy won 2nd place receiving a trophy shooting 4 under par after two days for a final score of 68 (par being 72), just 1 stroke from first place. Jessy shot 2 eagles and 5 birdies. March 18th, 2017 "Stuart Local Tour Spring 2017" - Martin County Golf & Country Club in Stuart, Florida. 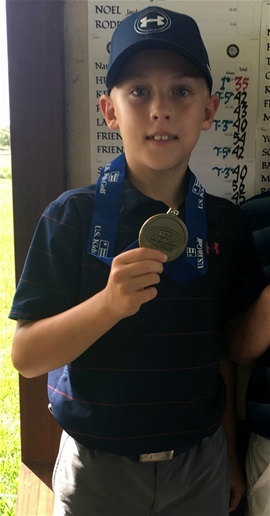 Today was Jessy's 8th Birthday and he won 1st place receiving a gold medal shooting 2 under par (par being 36) with a score of 34. 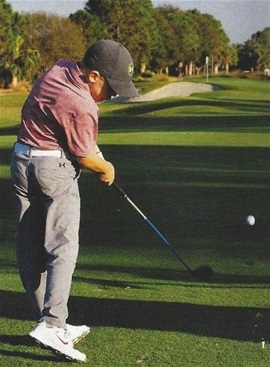 This was his first tournament in the eight year old division and he shot 5 birdies today. 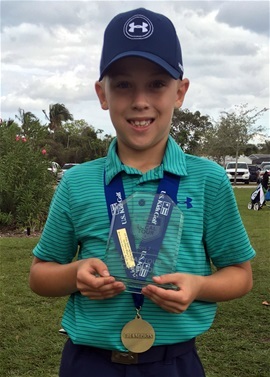 March 5th, 2017 "Stuart Local Tour Winter 2017 and Tour Championship" - Martin County Golf & Country Club in Stuart, Florida. 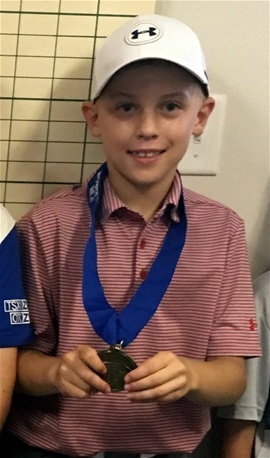 Jessy won 1st place receiving a gold medal and a Local Tour Championship trophy shooting 1 under par (par being 36) with a score of 35. Jessy won first in all 5 of the series to win the Tour Championship. February 26th, 2017 "Stuart Local Tour Winter 2017" - Club Med Sandpiper in Port Saint Lucie, Florida. Jessy won 1st place receiving a gold medal shooting 4 under par (par being 36) with a score of 32. He shot 4 birdies and was bogey free. February 19th, 2017 "Stuart Local Tour Winter 2017" - Martin County Golf & Country Club in Stuart, Florida. Jessy won 1st place receiving a gold medal shooting 3 under par (par being 36) with a score of 33. He shot 3 birdies and was bogey free. February 12th, 2017 "Stuart Local Tour Winter 2017" - Club Med Sandpiper in Port Saint Lucie, Florida. Jessy won 1st place receiving a gold medal shooting 3 under par (par being 36) with a score of 33. He shot 1 eagle, 1 birdie and was bogey free. January 28th, 2017 "Stuart Local Tour Winter 2017" - Martin County Golf & Country Club in Stuart, Florida. Jessy won 1st place receiving a gold medal shooting 5 under par (par being 36) with a score of 31. He shot 5 birdies and was bogey free. Jessy played perfect today. January 14th & 15th 2017 "Copperhead Classic 2017" at Innisbrook Golf Resort on the North Course in Palm Harbor, FL. Jessy won 1st place. This was his 3rd U.S. Kids Regional Copperhead Classic win a row. On day one Jessy shot 33 and day two he shot 33 for a total of 6 under par for both days (par being 36 each day). He shot 7 birdies over both days with day 1 being bogey free. 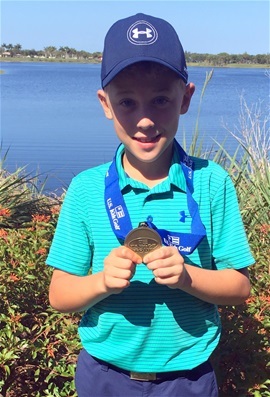 January 8th 2017 "The Junior Honda Classic" at PGA National Resort & Spa – Played on the "Fazio Course" in Palm Beach Gardens, FL. 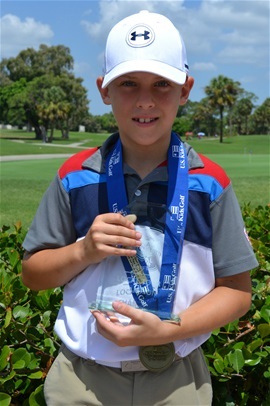 Jessy won 6th place in the in the boys 7 & 8 division shooting 4 over par (par being 36) for a final score of 40.